1969-1973 Nebraska Inspection Sticker - $20.00 : Bob Hoyts Classic Inspection Stickers, Add a Final Touch to your Restoration! Nebraska began it's inspection program in 1939. This sticker was first issued in 1969 and was to expire in 1970. The year of expiration was punched out. The following year, the same type isued was used again with expiration date of 1971. 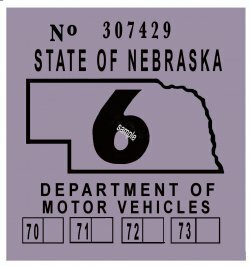 Nebraska intended to use this same sticker until 1972 with a 73 year to expire but aparantly abandoned the sticker and made a change in it's program and began issuing one year stickers in 1971, with expiration dates a year later. This Inspection sticker was carefully restored both front and back keeping true in color and size to the original. Our thanks to Dr. David Kaufman of Omaha, NE for providing the original image.